First 4 Figures Meta-Ridley Statue Available for Pre-order! First 4 Figures has opened up pre-orders for the latest in their Metroid Prime series of statues, Meta-Ridley. The massive statue is being offered in a regular (REG) version as well as an exclusive (EX) version and is the first in F4F’s new “Metroid Villains” line. Reservations opened today and will go for the next 3 weeks, those who wish to try for a low number in this new line or are interested in F4F’s Signature Card will want to return on January 25th at 10AM EST to validate their order early. Price may be an issue for some and to assist those on a budget, First 4 will be offering a 2 year payment plan. This won’t necessarily equate to a 2 year production as many are already wary of the amount of time the 1/4 Varia Suit has taken to come out (just shy of 3 years), but extenuating circumstances with fan requested changes, Nintendo approvals as well as Nintendo changes at the last minute created a longer then usual delay. With the majority of work done with Meta-Ridley, we will hopefully not see the same delays and keep within the 1-2 year normal release schedule. As with most Nintendo licensed statues, Meta-Ridley’s pose is based off of official Metroid Prime artwork in a flying attack position. The statue is made of resin with high attention to details such as worn armor and multi-layer paint with a round base inspired by the Artifact Temple floor. Meta-Ridley’s wings will also glow in the dark. The statue will be packaged in molded foam inserted into a full-color art box, the authentication card for registering on the website, and be shipped in a brown shipper to protect the art box/statue. The Exclusive version of the statue will be the same as the Regular version above but will also include a light up feature in the chest (core) area as well as the eyes. Validation Day will be on January 25th starting at 10AM. As Meta-Ridley is the first in the Metroid Villains line low serial numbers will be available to those who validate soonest. This is basically a button that appears on your order page that allows you to confirm your order. All orders made prior to Validation Day are still valid; however, they will only be eligible for signature card bonus’ if the consumer returns on 1/25 to ‘validate’. What’s the benefit of validating on 1/25? Validation will allow you the opportunity to reserve a low number. Whether you get that number or not will be unknown to you until the package arrives on your doorstep. 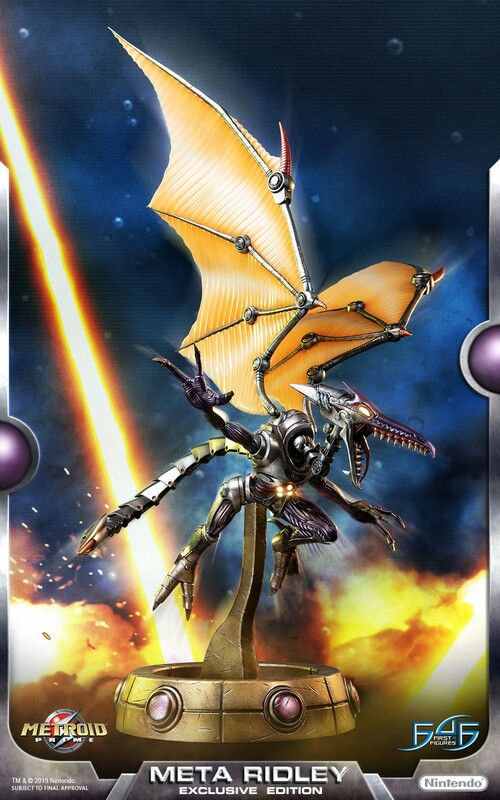 Additionally, validation will include a special Meta-Ridley art card with Alex Davis’ (the owner of F4F) signature on it, a special hologram sticker, and extra bonus reward points on your account. All original content © Metroid Database 1996-present.